Hi everyone! I hope your summer is going well, mine is so far, when it isn’t full of work! 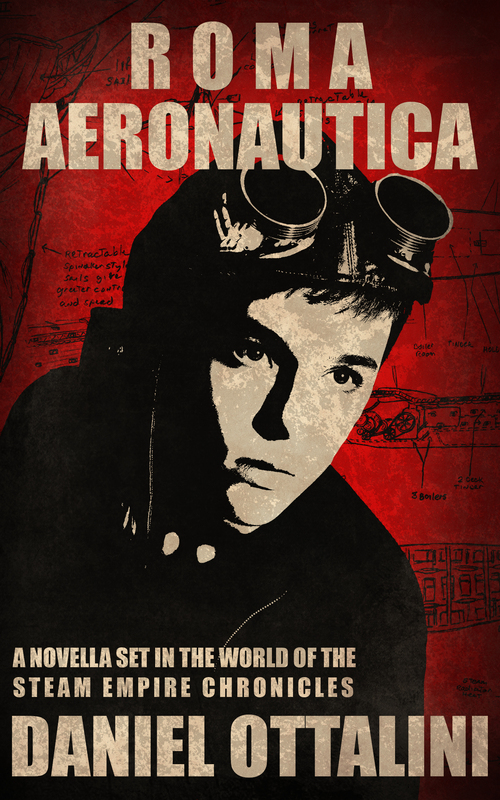 I am excited to announce that my new novella, Roma Aeronautica, is available for purchase on both Amazon and Barnes & Noble (and will be up on Smashwords for iPad owners/etc., as soon as possible!). Roma Aeronautica takes place in the same world as the Steam Empire Chronicles, and would be described as a character prequel. In this novella, we follow a much younger Rufius Tiveri Cassi Alexandros, critical traveling companion and confidant of Constantine and Julius in the main novel series, as he navigates the tough world of Roman military politics and education. Readers will gain further insight into how Roman traditions and technology have been modified and merged to align old with new. New enemies are made, and the origins of old friendships are discovered. In my personally favorite scene, Alexandros must try to keep a juvenile Tuderis from getting into any trouble aboard their training vessel. No wonder they got stuck serving together after that! This novella clocks in at roughly 20,000 words, a great length for a beach read or a short airplane ride. Unlike my full length novels, there are no interior illustrations, but you get a lot of action in a short amount of time! By the way, keep an eye out for some of the new protagonists to raise their head in other novellas. Sometimes you just can’t keep a convincing bad guy down. “You’re not to be fiddling with this here machine, Cadet Tuderius. It is a delicate piece of machinery that I am entrusting to all of you to return to me in one piece. One working piece that is.” He glanced at Tuderius. “One working, complete, unmodified, engine,” he amended quickly. You can purchase the novella through the links above, or go to the Books page of my blog for the links as well. Ciao!